Painter, silhouettist, draughtsman and printmaker, member of a Swiss family of artists. His paternal ancestors were patrician Genevese merchant bankers. As a young man he soldiered at Kassel in Germany and in Italy, where he fought for Savoy in the War of the Austrian Succession (1740-48). In 1752 he was elected to Geneva s Council of Two Hundred and served his native city as a magistrate. He had no formal artistic training, but from his youth he clipped out of paper or cards freehand profiles of a kind that later came to be called silhouettes. He also devised what he called tableaux en dcoupures, cut in vellum or parchment on the scale of large reproductive prints; these represented antique subjects, landscapes and genre scenes. He is best known for his witty paintings, cut-out profiles, prints and drawings of the writer and thinker Voltaire. 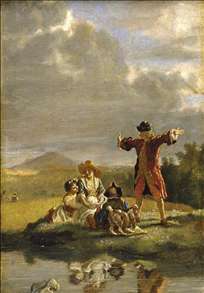 See more details about "Voltaire Narrating a Fable"